It's the beginning of the 20th century and North Pole is yet to be conquered by man. Several teams are on the mission at once. The competition is harsh and the arctic is merciless. Which team will be the sole survivor and be remembered always as bold conquerors? Find out in Race to the North Pole. 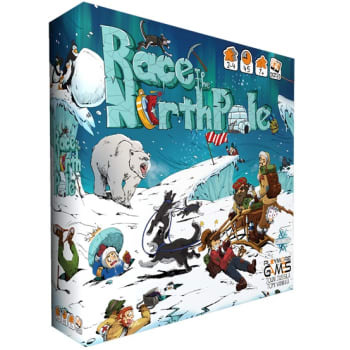 Players try to get their whole expedition from their ships to the North Pole. They will have to endure the unforgiving wilderness, the unexpected weather and the other fame hungry teams. It's who can adapt the best into the ever-changing harsh conditions that will be remembered as the conqueror of the North Pole. 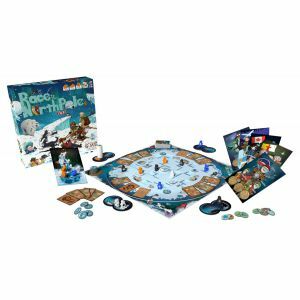 The game features a unique rotating board that simulates the unexpected Arctic weather. The easy to learn - hard to master mechanic has deep strategical elements which make every playthrough exciting and challenging. We're taking this board game into a whole new level with an optional free-of-charge app. 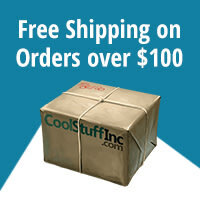 It gives players loads of new content and mechanics to use with the game through their smart devices. These upgrades guarantee endless replayability value. Start packing - The race is on!